A European Christmas is very different to an Aussie one. There’s no scorching heatwaves, sizzling BBQs or Christmas Day at the beach. But, there are the twinkling Christmas lights, warming up by a fire with a mulled wine, and our favourite, the magical Christmas markets that pop up around European cities. If you’re heading to France this festive period, you’re in for a treat. There are plenty to choose from, from the grand to the cute and quaint, it can be a difficult task on deciding which ones to visit. 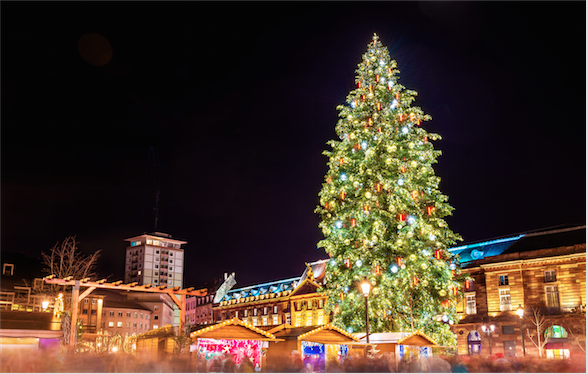 DriveNow has rounded up the most magical Christmas markets to visit in France this year. Enjoy. The infamous Strasbourg Christmas square! For a true festive French experience, head to France’s oldest Christmas market. Strasbourg Christmas market dates all the way back to 1577. Today, over two million tourists visit here every year to take in the beauty of the hundreds of miles of twinkling lights, a living nativity and live Advent concerts. Sample the French Christmas cookies and Strasbourg’s traditional spicy hot orange juice. You’ll be left in awe at the magic of this festive market. It’s no wonder it has been named ‘Best Christmas Market in Europe’ by tourists time and time again. If you’re staying in the southern region of France, add the Montpellier Christmas market to your must-visit list. Located at Comédie square and the Esplanade Charles de Gaulle, there are over 160 stalls of traditional Christmas gifts, local produce, mulled wine, and sweets all being sold from traditional small wooden huts. Travelling with children? Santa Claus is at the heart of the market, kids can post their Christmas wishlists in the mailbox, and Santa will visit to collect them and say hello to the children a few days before Christmas. Make Christmas one to remember with a trip to the magical Montpellier Christmas market. The magical huts at Colmar Christmas market. 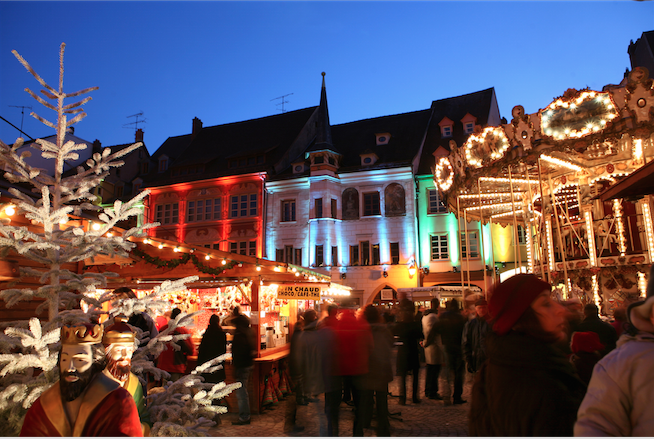 If you’re looking for a magical Christmas market, then Colmar is your answer. The French city is a setting straight from a storybook, with medieval houses and quaint cobbled streets. During the festive period, the setting is transformed with glittering Christmas lights and five Christmas markets connected by a labyrinth of small streets. For the wine connoisseurs, this is the market for you. Located within the Alsace wine region, the markets are brimming with wine tastings, try the vin chaud rouge, a mulled wine with honey, orange, and cinnamon. An authentic French Christmas experience. Titled one of the most beautiful Christmas markets in France, the Metz Christmas market is the perfect place to experience the magic of the festive season on the dark winter days. Walk around and take in the sights of the illuminations, savour the traditional French gastronomic delights or show off your skills on the city’s open-air ice rink. On the 1st and 2nd December, there will be extra special events on for the St Nicholas festivities. Enjoy getting into the festive spirit in Metz. Last but certainly not least, we can’t list the most magical Christmas markets in France without mentioning the country’s capital, Paris. The city of love is home to plenty of Christmas markets, so there is something for everyone. You’ll be spoiled for choice with the wooden chalets lit up by the magnificent Champs Elysées where you can find art, crafts, and delicious French delights. Take a ride on the Ferris wheel and take in the sights of this beautiful capital city. It indeed is a magical way to spend the festive season. No matter which of these most magical Christmas markets you choose to visit in France this year, DriveNow’s car hire tool makes it so much easier to book your transport before your Christmas vacation. So, when you land you can jump straight into the festive spirit and enjoy your trip.